The Presidential Advisory Committee Against Corruption (PACAC), has urged the Independent Corrupt Practices and Other Related Offences Commission (ICPC) to focus on public service auditing in order to reduce cost of governance and improve efficiency. 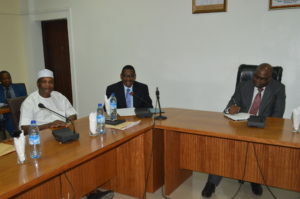 The call was made by the Executive Secretary of PACAC, Prof. Sadiq Isah Radda, during a courtesy visit by members of the Committee to the Chairman and Board members of ICPC at the Commission’s Headquarters in Abuja. In his remarks at the occasion, the ICPC Chairman Prof. Owasanoye who was formerly Executive Secretary, PACAC, expressed delight in receiving the team. He told the team that although he had left PACAC, he believed that the opportunity to work together would continue. One of ICPC’s Board members at the occasion, Hon. Mrs Olubukola Balogun, expressed gratitude to PACAC for the visit. She promised that the Board members would work together as a team to turn the country around for the better with the cooperation and support of PACAC.